Happy Easter!!! I hope this weeks Sunday Stamps finds you all having a wonderful Chocolate Bunny filled day. Here is my Card for the letter "F".. I choose the set "The Free and The Brave" I had a lot of "F" sets it was a hard choice.. But if you know me you know I love this set as much as the Skull one! I know this one begins with (The) but we aren't counting that. The technique I choose is called spotlighting with a Punch and you can see a video tutorial I made on it here. The card base is Riding Hood Red & Pacific Point. The image is stamped on Naturals White and mounted on Basic Black. My focal image is stamped with Black StazOn. I used the 1 1/4 & 1 3/8 inch square punches. And Way to Go to the US Navy Seals!! 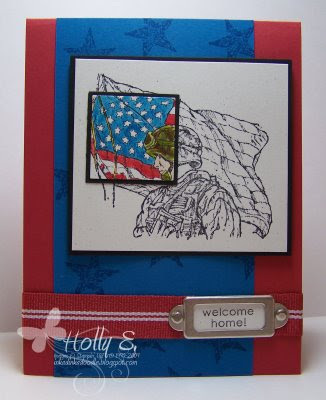 How fitting my card says "Welcome Home". They just rescued Capt. Richard Phllips. These pirates need to be stopped! They layout is from this past weeks Card Sketch over at Splitcoast CC223. This week we are on the letter "G".. Come and play along and add your card to the Mr.Linky Box below.. I will pick from the entries next Sunday and the winner will get a prize! Here are the set I have that begin with the letter "G"..Good Friend, Garden Whimsy, Good Friend & Gratuitous Graffiti. Another great bunch of sets...going to be another tough choice. I'm taking a blog break till Wednesday!! I need to get my Artisan Award Projects finished so I will see ya on Wednesday Evening! Love your card - very pretty! Well done!